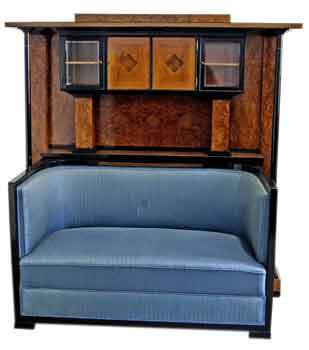 ALL OUR FURNITURE OFFERED HERE ARE ORIGINAL AS WELL AS VINTAGE ! SYCAMORE VENEER WOOD / PERLA HORN & PLANE TREE & BLACK STAINED PEARWOOD / ADDITIONALLY, SEVERAL INLAY WOODS & MOTHER-OF-PEARL EXISTING. Olbrich was staff member of Otto Wagner's architect's office as well as architect of famous Vienna Secession's building. He went to Darmstadt-Mathildenhoehe in year 1899 in order to work as designer and architect there. The Music Room cabinet is of oblong form type / it has closed back wall (= backplane), further it is topped by tiered plates attached to ledge; underneath, there is a pair of slender circular columns existing, supporting the ledge as well as framing eight-fold doors edged by strips accentuated by black color. Additionally, doors' surface is ornamented with quatrefoil-shaped rosettes. Inside, various shelves & two drawers are existing. 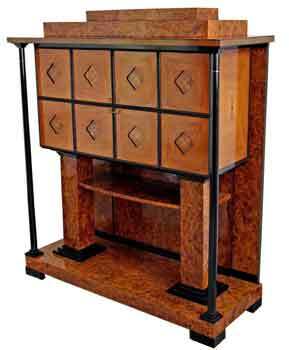 - The cabinet's area below consists of a pair of four-edged / square columns attached to a platter supporting the cabinet's chest with doors as mentioned above. Beyond that, a shelf connects the square columns to each other. The cabinet of rectangular form type is designed as backplane for the settee which is fixed component of it. The cabinet having closed back wall is topped by plate attached to ledge; underneath, there is a pair of slender circular columns existing, supporting the ledge as well as framing four-fold doors edged by strips accentuated by black color. Additionally, two doors are glassed or the surface of other two doors is ornamented with quatrefoil-shaped rosettes. Inside, some shelves are existing. Beneath, a pair of four-edged / square columns attached to a platter support the cabinet's chest with doors as mentioned above. Finally, the settee with bright blue upholstering is attached to the cabinet's area below. SYCAMORE VENEER WOOD / PERLA HORN & PLANE TREE & BLACK STAINED PEARWOOD / ADDITIONALLY, SEVERAL INLAY WOODS EXISTING. The oval tabletop is supported by a pair of slender circular columns as well as by a pair of four-edged / square columns attached to elliptic platter at bottom. The table's plate is excellently ornamented with inlay works (= very elegant appearance !). Both chairs - perfectly matching - are upholstered with bright blue fabric / the backrests are stunningly worked: inlay works & strips accentuated by black color are visible. TWO CHAIRS ARE AVAILABLE ! 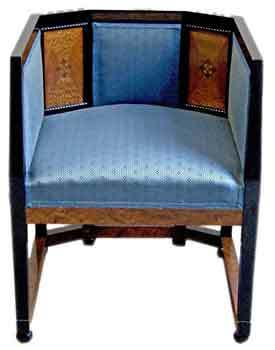 This armchair - perfectly matching the Olbrich furniture pieces we're presenting here - is upholstered with bright blue fabric (like the chairs) / the backrest is stunningly worked, too: inlay works & strips accentuated by black color are visible. Additionally, there are wooden struttings at area below existing to which the armchair's feet are attached. The flower stand is of square form type, based on socle with tapering edges / four slender circular columns & a four-edged (square) column attached to the base support the flower pot. Additionally, strips accentuated by black color decorate surface of flower pot. 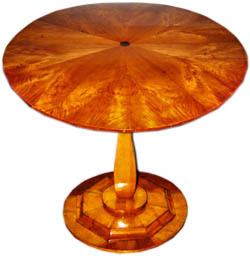 the table's elm wood veneer is of excellent quality / the round table's base is multiple tiered: there is an octagonally shaped base put between two round platters / the dainty as well as slim stalk of tapering type - wearing the round table's plate - 'grows out' of tiered elegant base, so that this table is of special 'lightweight' impression. 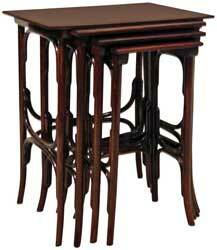 This table for parlor is made of massive wood (the table's plate & column have nut wood veneer). The abundant sculptured decorations are made of wood consisting of limes. The GILDING as well as the so-said ANTICO VERDE painting are ORIGINAL. HIGHEST QUALITY HANDWORK (MUSEUM-LIKE QUALITY) ! EXTREME RARENESS ! - three sculptured dolphins are attached. - The column's base is decorated with a sculptured border of acanthus leaves. PLEASE NOTE that the table's plate has a stunning nut veneer having a star's appearance (= pattern of radiated form type). VERY GOOD ORIGINAL CONDITION (READY FOR USE) ! Georg Himmelheber, Biedermeiermoebel, Munich 1987, illustration number 242 | Joern Bahns, Biedermeier-Moebel (Entstehung, Zentren, Typen / = origin, centres, types), Munich 1979, page 41, illustration numbers 6-8. It is a most elegant baroque writing cupboard / cabinet with finest marquetry (this furniture piece consists of a top part as well as of a lower section = so-said 'type a deux corp'), with various drawers whereas the three large drawers of part below are attached to chest's total width. The middle part of cupboard's top piece is emphasized by a door. - Mentioned marquetry consists of figurine at top part whereas birds are visible at lower section / curved front side is structured by squares having corresponding inlays. - The cabinet's interior equipment consists - apart from the mentioned drawers - of inclined writing surface with two interior drawers. This cupboard stands on round feet of squeezed type. Original fittings made of brass existing. 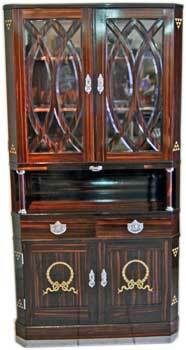 Mahogany wood, decorated with various precious woods (inlay works) / refurbished by hand / tables with gorgeous marquetry inlaid / additionally, two tables have marquetry inlaid signature 'Galle', too. 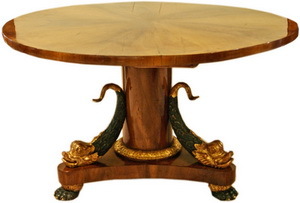 ART NOUVEAU TABLE of most elegant appearance: The oval table's plate is attached to fluted pair of columns which is based on oblong support covered with fittings made of brass. 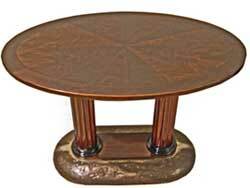 The excellent veneer of table's plate is a most remarkable peculiarity of this piece of furniture ! - two lateral sides are attached to middle part (with four doors in total, having many pigeon holes) / original brass fittings (lockets and handholds) preserved ! 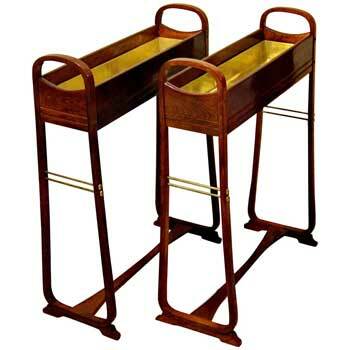 This most elegant serving trolley consists of wooden framework with rounded edges / both framework's parts are connected to each other by glass shelves attached to top as well as to area below. Additionally, there are four handholds made of brass existing. 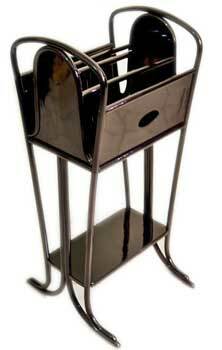 Finally, the serving trolley stands on four original wheels (related fittings made of brass, too). 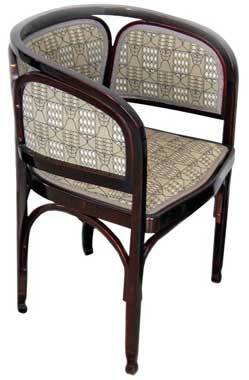 The chairs have been newly covered by Art Nouveau fabrics made by well-known Viennese firm Backhausen. - THE TABLE'S PLATE CAN BE EXTENDED TWICE / THE TABLE'S PLATTER IS ATTACHED TO MASSIVE COLUMN COVERED WITH BRASS MOUNTING AT AREA BELOW. THE CHAIRS' FEET ARE TRIMMED WITH BRASS FITTINGS, TOO. Michael Niedermoser (1835-1908) - born in Salzbourg / Austria - owned a carpentry in Vienna as from the year 1860 / as from circa 1890, Niedermoser cooperated extensively with various architects, and the working relationship with Josef Maria Olbrich has become quite intense. The armchairs are (newly) upholstered as well as covered with cloth made by famous Viennese Backhausen firm: excellent Art Deco pattern of type of peacock eye - the colours are: blue - old rose - orange - cream shaded / the armchairs are of finest appearance ! The tables’ platters are abundantly decorated with Art Nouveau floral ornaments - stunning inlays of various colours - of quite realistic impression: The patterns are depicting flowers and plants such as rose flower’s blossoms, leaves of ivy, tendrils of woodbines and fruits of acer. The 'egg' chair is of very elegant rare shape (elliptic form type, made of bentwood / seat and backrest are made of original wickerwork.) The general construction of this rocking chair gives an advantage to swinging movement / simultaneously with this fact, we have to state that interaction of this chair's different parts, elliptic and vertical struttings, partially decorated with balls, evokes a gorgeous appearance. Jiri Uhlir, Vom Wiener Stuhl zum Architektenmoebel (published by Boehlau - Verlag, Vienna , Cologne, Weimar / 2009), pages 108-110. TWO ARMCHAIRS ARE AVAILABLE ! Concerning Thonet firm label existing at reverse side of each chair. - A special feature is these chairs' stunningly manufactured backrest made of seven vertical struttings attached to middle area; additionally, a strutting decorating each lateral side connects the chairs' seat with backrest which has half-round frame at top area. 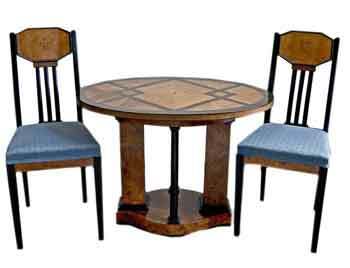 - These Thonet chairs have a formal relation with a Kohn model 369/5 attributed to circle of Josef Hoffmann. WICKERWORK ON SEAT HAS BEEN RESTORED / the chair's armrests and backrest are excellently made in THONET MANNER / the wooden parts are amazingly bent / MOST ELEGANT MODEL ! 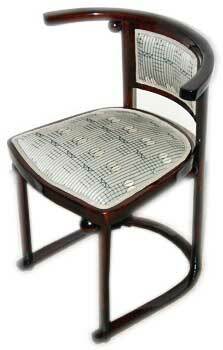 This model was created by Thonet before year 1904. 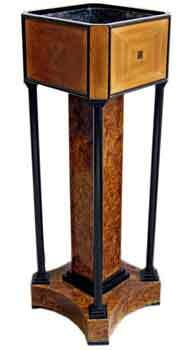 - It is made of finest bentwood, of most elegant appearance: Various decorations looking like circles are excellently contrasting the vertical struttings. 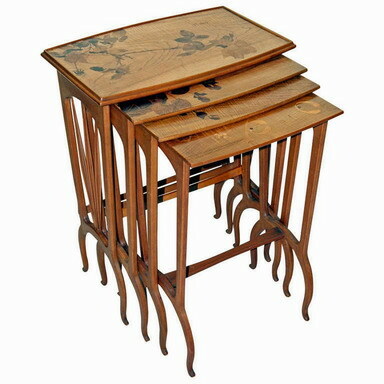 Thonet rarest and most remarkable pair of Art Nouveau plant / flower stands. Model number 9582. Designed circa 1904. Made circa 1905-1907. Design: School Of Otto Wagner / Marcel Kammerer. Beechwood / bright mahogany stained / brass (= struttings and brass liner). Refurbished by hand. Catalogue 'Thonet Bentwood & Other Furniture / The 1904 Illustrated Catalogue' (re-printed by Dover Publications, Inc. / New York, 1980), page 145 | Catalogue number 9582 Giovanni Renzi, Il mobile moderno / Gebrueder Thonet Vienna + Jacob & Josef Kohn, Silvana Editoriale (Milano) 2008, pages 146 - 147. 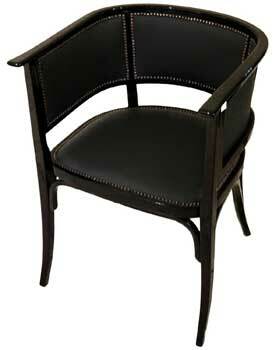 ARMCHAIR WITH ARMREST AS WELL AS WITH BACKREST which are U - shaped. Seat and all parts of backrest are upholstered, further they are COVERED with GREEN LEATHER as well as decorated with elegant rivets made of brass. 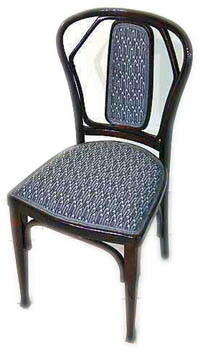 THIS MODEL HAS BECOME FAMOUS DURING 1907/08 WHEN THIS TYPE OF CHAIRS WAS USED FOR FITMENTS OF VIENNESE CABARET FLEDERMAUS. 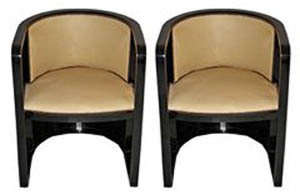 BASED ON THIS FIRST MODEL, SOME VARIANTS WERE MADE BY THONET, TOO - THE ARMCHAIR OFFERED BY US HERE HAS TO BE ATTRIBUTED TO THIS TYPE OF FURNITURE PIECES. The magazine box with some pigeonholes is attached to four high tapering feet / additionally, there is a shelf existing at part below. ORIGINAL THONET FIRM LABEL EXISTING AT REVERSE SIDE ! 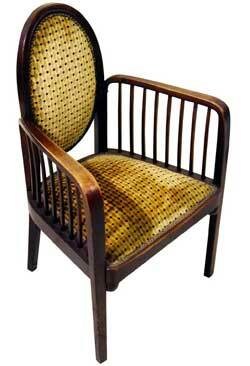 DESIGNED BEFORE 1904 / ELEGANT ARMCHAIR WITH ARMRESTS WHICH ARE CONSTRUCTED BY WOODEN STRAIGHT & VERTICAL STRUTTINGS. Please note: EXCELLENT ORIGINAL CONDITION (READY FOR USE !) / Not restored which means that upholstery is in good ORIGINAL condition, too. The Kohn firm label is existing beneath the upholstery. Kohn - Catalogue of 1904 & 1907 / Armchair Number 416 On Page 103. Giovanni Renzi, Il mobile moderno / Gebrueder Thonet Vienna and Jacob & Josef Kohn, Milano 2008, pages 184 / 185. The related design had been created by Marcel Kammerer - a pupil of Otto Wagner - in year 1904, on behalf of Hotel Wiesler in Graz (Styria / Austria) . The backrest is of stunning appearance, due to the elliptic decoration attached to it / the armrests are of solid construction. 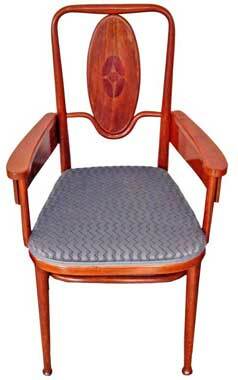 The seat is upholstered with new fabrics with Art Nouveau pattern. Gustav Siegel (1880-1968) - pupil of Josef Hoffmann and interior designer as well as architect - had invented this famous prototype of an Art Nouveau Seating-Accomodation / firstly it was an armchair (= fauteuil) with low backrest before year 1900. It was presented at the Paris World Exhibition then / this type of design has been repeatedly varied and copied afterwards. Giovanni Renzi, Il mobile moderno / Gebrueder Thonet Vienna and Jacob & Josef Kohn, Milano 2008, pages 28 / 29 and 80 / 81. FOUR CHAIRS ARE AVAILABLE ! We're always buying high quality items. We're looking forward to receiving your offers.